New FDA regulations expected to be released this summer have the American Vaping Association worried that 99 percent of all vaping products could become illegal almost instantly. As a result, only the largest companies will survive and the cost of compliance will limit vapers choice and dramatically increase prices. The biggest hit will be felt by e-juice manufacturers, though. A manufacturer will be forced to register its products within six months and complete a “Premarket Tobacco Application,” or PMTA, within two years. PMTAs are expected to cost upwards of $2 to $10 million according to healthcare regulatory firm SciLucent. Such an expense will mean the end of locally produced e-juice, which up to two-thirds of vape shops count on to pad their bottom lines. It also makes illegal the sale of any e-cigarette device produced after February 15, 2007 unless it is approved through the FDA’s new PMTA process. Device manufacturers will find it easiest to afford the application fees considering these companies have a much larger budgets and broader reach than most e-juice manufacturers. However for individual e-juice makers, it’s a tough choice: either come up with the high application fees or shut down. The proposed rules have a lot of people upset, especially considering the FDA does not have similar regulations on traditional tobacco products. Perhaps the worst news for vapers is the fact that the cost of FDA oversight will be passed on to us. The industry self-regulates itself, at times banning products based on new research. Several e-juice manufacturers — most notably Mt. Baker Vapor — halted sales of cinnamon-based flavors in 2013 over a study’s finding that inhalation could be toxic. While the findings of this study have since been disputed, it’s a good example of quality controls already in place. 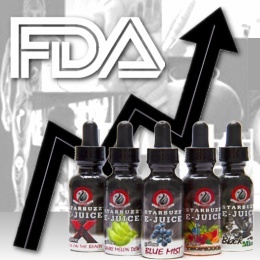 I reached out to several popular e-juice companies for comment regarding the new regulations, and how they see them affecting their businesses moving forward. All expressed concern with how the law is currently written, and expect it to limit our options and force them to raise prices on our favorite e-juice flavors. While the vaping industry is growing by leaps and bounds, it is still made up by mostly small to medium sized businesses. The proposed guidelines would be a tremendous challenge to navigate both legally, functionally and financially. While we welcome “common-sense” rules be put in place to protect consumers, we feel these are easily accomplished without lengthy and costly application procedures. The guidelines as they stand now are a silver platter on which this industry is served to big tobacco. We hope to have our voices heard and receive a fair shake in the end. For the sake of those employed in this industry, and those whose lives have been improved by it. Part of what makes this industry great at the moment is that so many companies are able to come in and make a mark, giving the public a huge amount of juice to choose from… if the FDA were to limit the number of options available to consumers, we think less people will be able to successfully use vaping to quit smoking because of the higher price point and lack of variety. A Limited Choice of Devices? Even though e-juice manufacturers are likely to take the biggest hit, hardware companies will feel the burn as well. Sure, most can probably handle the costly (and complicated) PMTA process, but that doesn’t necessarily mean that you’ll have the same choices that you have right now. The proposed rules, as they stand, only protect devices that were developed prior to 2007. So any mod or tank system that has been created since then will have to go through a long FDA approval process, and no one knows exactly what they’ll be looking for to determine what is – or isn’t acceptable. Only time will tell how our vaping gear will be impacted, but it’s safe to say that we’ll have less options, and they’re likely to cost more too. While the proposed regulations, as they sit, are definitely worrisome, finding a happy medium will be the key to a positive future for the vaping industry. The FDA’s proposal for child resistant packaging is one item that makes sense, although many manufacturers already childproof their products. Creating some type of system where e-juice companies register themselves with the FDA probably isn’t a bad idea either. No vaper disputes that nicotine is a hazardous substance, and some combinations of flavoring or dyes may be dangerous. An e-liquid manufacturer should have a basic understanding of the ingredients they use and their potential harmfulness, if any. That seems like common sense. What doesn’t seem necessary is the application process and its expected cost to manufacturers. Most e-juice companies are small businesses, and spending thousands on the application process alone is a tough pill to swallow. Many are likely to close, and cheap e-juice will become a thing of the past. Part of vaping’s success has been due to the competitive pricing compared to tobacco. These days a pack of cigarettes can cost upwards of $10 (or more) depending on where you live. In comparison, a 30ml bottle of e-liquid costs about the same and will last the average vaper for weeks. If vaping becomes just as costly, with even less options to choose from, some people are likely to switch back and many smokers will avoid giving vaping a try altogether. It’s for this reason that AVA, CASAA, SFATA, and other organizations are working hard to prevent the FDA’s new regulations from ever seeing the light of day in their current form. Be sure to support these organizations and follow them for the latest updates, or to learn how to get more involved. When exactly will these regulations take effect? Should I be loading up on DIY supplies? I cannot imagine having to go without decent juice to vape….this very well could drive me back to smoking, and I really don’t want that. Recently CASAA emailed me on this suject as well has Senator Ted Cruz. The way it looks, the grandfather date will be date law passes. There is no getting around regulations by FDA UNLESS NICOTINE IS COMPLETELY REMOVED AS IT IS A DRUG. Comprimise is the only option.